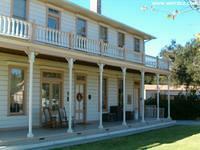 Located just off Highway 101, in Newbury Park is the Stagecoach Inn. 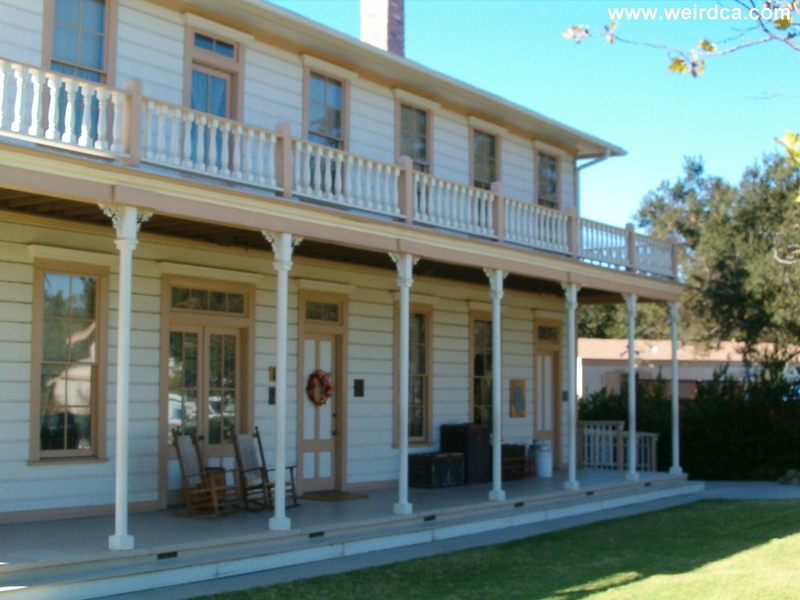 Formerly the Grand Union Hotel, the Stagecoach Inn was originally built in 1876 to accommodate travelers going to and from Los Angeles and Santa Barbara. The lavish two story hotel with balconies and a wraparound porch cost James Hammell, the owner, only $7,200. It didn't remain a stagecoach stop for ever or even a hotel, but later served as a church, post office, gift shop, military school, restaurant, and tearoom. 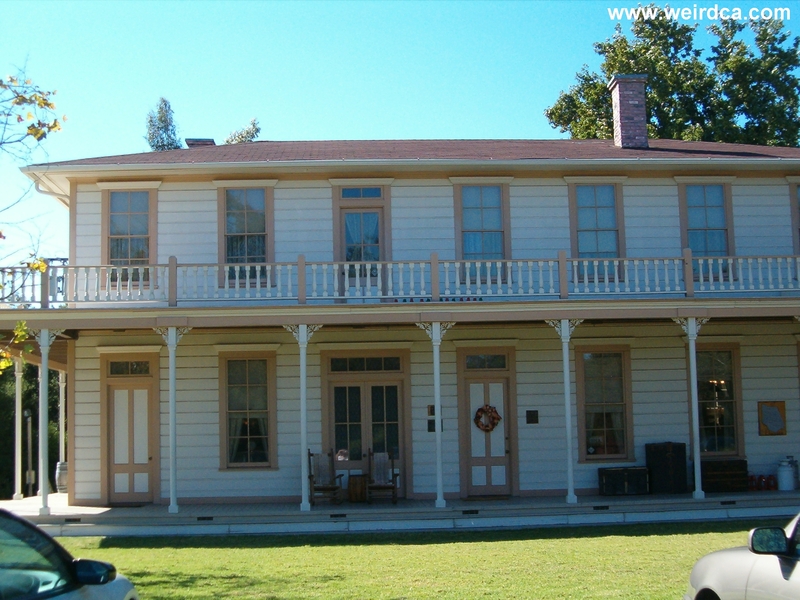 Today, the Stagecoach Inn is not even the same structure that was originally built in 1876. Once located about two hundred yards north of its present location, In the 1960's it was relocated in order to make room for the highway to its present location after being declared a Historic Landmark. In April 1970, the entire structure was burnt down in a mysterious undetermined origin fire. Utilizing old photos and plans the entire structure was luckily rebuilt just as it had been. It reopened July 4th, 1976. The inn now serves as a picturesque museum showing collections, furniture, and other items from the late 1800's. A variety of antique collections can be seen inside the structure. At the time I visited, there was a gramophone exhibit displaying a wide array and styles of the ornate gramophones from another era. Additionally there was an entire collection of hair art or pictures made out of weaving and styling human hair into ornate and complex patterns. But beyond the decades of history, past the historic collections of furniture and antiques, the inn is reported to be haunted by not one, not two, but possibly three different spirits. The first of the three is a young boy who according to legends stayed at the inn in the 1890's. The boy wandered off from the inn into the nearby hills, sadly becoming hopelessly lost and never being seen again. His body was never found and it was assumed he died in the wilderness. The boy's voice can now be heard calling eerily through the house. Next up, is the ghost of tall woman who has only been seen out of the corners of visitor's eyes, briefly seen in a flash and then gone. But after the elegant phantom disappears into nothing, the smell of her pungent perfume is left behind to remind you of her presence. She was mostly encountered from 1952 through 1965. But the most well known ghost is called Pierre Duvon (or Duval), apparently a burly bearded mountain man who was supposedly shot and murdered while asleep in the inn back in 1889. Now he performs a variety of poltergeist like actions throughout the inn as well as leaving unnerving cold spots on the stairs. In the late 1960's, the psychic Sybil Leek at the behest of the museum director, Dr. Cyril W. Anderson, identified the ghost and determined his name and fate. She described him as a bearded stocky man in his mid thirties. A month later, a pair of leather chaps along with a gun holster was donated to the museum. According to the man donating them, they once belonged to Pierre and the two items are now on display inside the museum. The room where Pierre was brutally murdered suffers from the greatest number of spiritual occurrences. The docents of the inn, unlike many other haunted locals, actually revel in their ghosts and will gladly discuss the stories surrounding the three spooks. They even show tourists the picture taken when the inn burnt down in 1970. According to some people, if you look close enough, you can make out the picture of what is possibly a wizened old man. Of the several pictures taken during the blaze, three are suppose to show the ghost rising up in the flames. Of course, some viewers believe that the image in the fire is that of a woman instead, so maybe one of the other ghosts is appearing in the picture instead of Pierre. But, you should visit, look at the picture and decide which ghost it is yourself. Another piece of history sits on location. If you look out the back window of the kitchen, down below near the basement area, there is a large sign that says, "Wild Animals Importer / Exporter". This sign is from Jungleland, an early zoo formerly located in Thousand Oaks that was very popular in the area decades ago. Since the place burned down after it was moved, how could it be haunted? The "Ghosts" were (from) the old location, and the building is a reproduction. None of it is original. Just curious about how it could be haunted still. I rekon' Ghosts and Spirits can do whatever they please, right?